Who doesn’t love Lego? 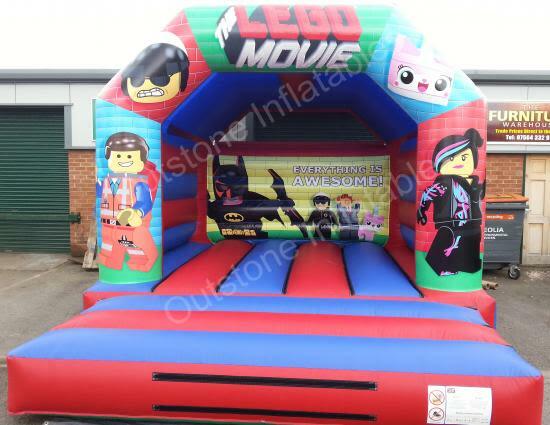 The Kids 12ft x 15ft Lego (2016) Bouncy Castle combines the world’s favourite toy with the energetic atmosphere of a bouncy castle to keep your kids entertained and delighted. Based on The Lego Movie, the castle is decorated with your kid’s favourite characters. Our hero Emmet and the tough, tech-savvy Wyldstyle appeal to girls and boys from the entrance of the castle. Lego Batman and a colourful cast from the movie decorate the back of the bouncy castle. Characters like the whimsical Princess Unikitty and the hilarious Bad Cop/Good Cop give the castle spice, and the movie’s slogan ‘Everything is Awesome’ in bold white letters sets the mood for it. With a blue and red colour scheme and a variety of characters, the castle is great for both boys and girls. Sparking the imagination and encouraging enthusiasm, it suits kids of all ages and types. A great crowd-pleaser, the castle is perfect for any Lego enthusiast, but also works well in a mixed crowd with a variety of interests. Booking is easy, and you can reach us online on our contact form, via email, or call us on 07760 753308. Contact us today and book a bouncy castle for prices as low as £55.